Next spring when the Minnesota Twins take the field in early April, outdoors, in Target Field, there will be no roof. After long talks, the deal for the new ballpark proceeded with no plans for a retractable roof, meaning a complete open-air stadium beginning in the 2010 season. Some fans have questioned this move; stating that the constantly changing weather in Minneapolis warrants the need for a roof. The weather in Minneapolis can be cold when the season begins in April, and cold again when hopeful playoff baseball rolls around in October. The chance of snow within the first week of the season is always possible, and rain can be a common summer�occurrence. These factors have led to many questions, but they shouldn’t. While no roof may mean a few cold days early and a few more late, there are at least eight other teams that have similar weather patterns and few problems with postponed games. 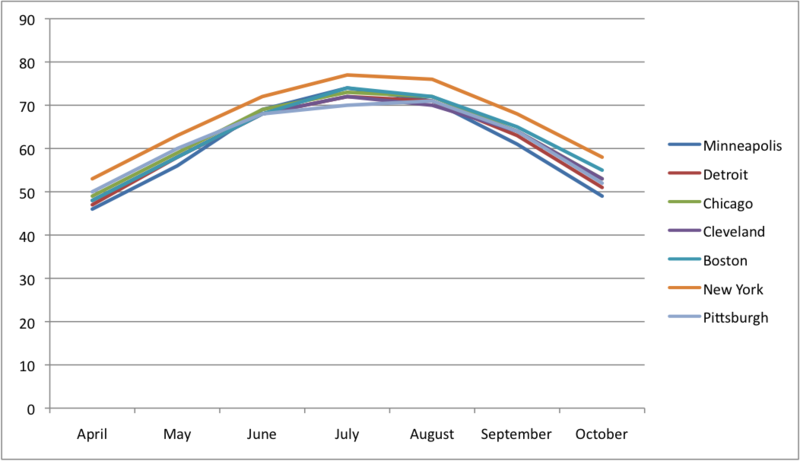 As shown in the graph, the average temperatures over the course of the season in Minneapolis, compared to six other cities (eight teams), are very similar. While the average precipitation varies much more than the average temperatures, Minneapolis overall sees very similar amounts of rainfall compared to the other cities included in the group. With the exception of June (4.1 inches), Minneapolis shares very similar amounts of�precipitation. 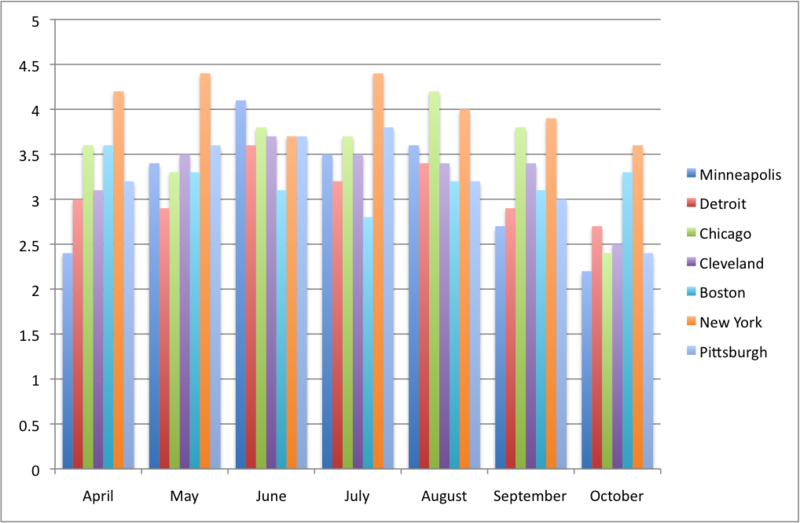 In April, September, and October the amount is considerably lower than the other five cities. Meanwhile, in the months of May, July, and August the totals are comparable to those in Detroit and Cleveland. This season in the month of June, the cities highest rainfall month, the Twins played only nine home games. While weather doesn’t alter any plans this season, a similar layout next year would fit well. The Twins for obvious reasons had no home games postponed in 2008, and the numbers for the other six cities (Mets and Cubs excluded) weren’t very high either. 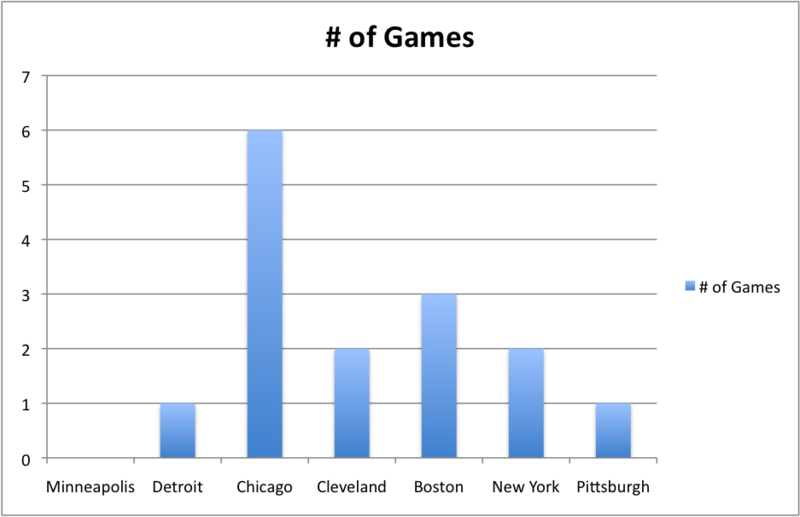 Detroit and Pittsburgh had only one postponed game each last season while the Yankees and Indians each had two and Boston had three. The number of postponed games for the White Sox (six) may seem alarming, but it shouldn’t be. Four of the team’s total postponed games came in the same week, including an entire weekend series.